R. acerinum is found predominately on Norway, Amur and hedge Maples, but both fungi can be found on susceptible Norway, Manitoba, Bigleaf, Sycamore, Red, Mountain, Silver and Sugar Maples trees. It causes prominent raised tar spots 5-15 mm across, usually with a furrowed surface. 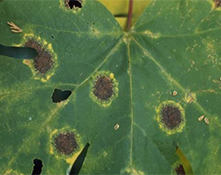 As Maple leaves develop to full size, light to yellowish green spots develop in the infected areas of the leaves. The area becomes yellow, with numerous small, raised, black spots forming within the yellow area. As late summer and early fall approaches the black spots coalesce to form a large, irregular, shiny raised spots with the appearance of wet tar, called a stroma. Severely infected leaves may fall prematurely. It occurs wherever maples grow in moist environments. 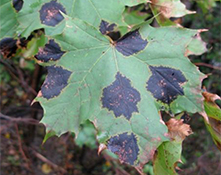 The disease cycle is similar for both species of the fungus that cause tar spot. In early spring sticky spores are released from fruiting bodies on diseased maple leaves lying on the ground, and travel in the air to developing maple leaves. 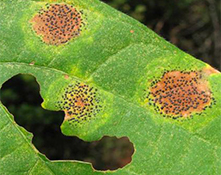 Within a month or two, light green spots develop on infected leaves. The tarlike spots don’t appear until late summer or fall. After over wintering the tarlike lesions on fallen leaves produce sexual spores that infect young maple leaves and continue the cycle of infection for another season. In recent years, tar spot caused by R. acerinum has been increasing in frequency and severity. The fungus overwinters on fallen, diseased maple leaves. Rake up and destroy maple leaves in autumn to reduce the amount of inoculum for the following spring. In the home landscape, raking up fallen leaves may be sufficient to manage the disease. In nursery settings, protective fungicide applications may be warranted as leaves develop in the Spring.